Girl Scouts Make A Difference! 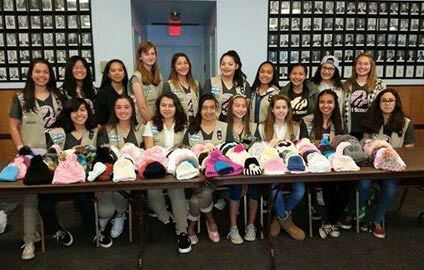 We are so amazed by a local Girl Scout Troop (4134) from West Covina, California, who made and donated 218 hats to Knitting Rays of Hope! This girl scout troop consists of 18 dedicated young ladies, 12 to 13 year old. Each girl had to learn how to loom knit and then surprised their troop leader, Christina Godoy by going above and beyond their individual personal goal of number of hats. We are very impressed with such young girls, who care enough about the world to make such an impact! This troop even mentored a younger Girl Scout Troop, who is interested in learning how to loom knit hats for charity. These girls did a remarkable job- and donated the most hats we have ever received in a contribution! This project was approximately 6 months long, including the researching and learning how to loom knit, with the biggest push beginning in November, 2014. In addition to this charitable cause, these girls are involved in many other extra curricular activities. We greatly appreciate all the girls in Troop 4134 for being such extraordinary, caring young ladies and their troop leader and families for their support and values they instilled in these girls. There are 91 hats for children cancer warriors. There are all different sizes, that would fit the littlest toddler cancer warrior to the brave teenage cancer warrior, all whom will have their choice of color, texture and style of hat. They made 111 hats for babies in the NICU. 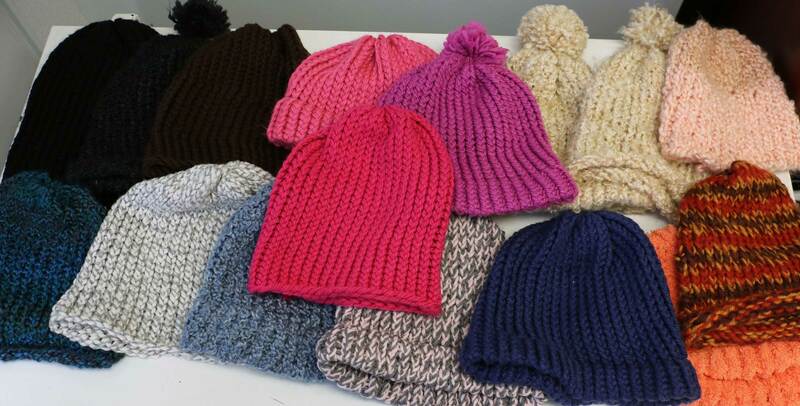 These hats will fit micro preemie to some larger babies who are admitted to the NICU for medical reasons. There are so many different combinations of colors and embellished with pom-poms, that we are sure the recipients and their families will feel special and loved. The girls did not forget about our strong adult cancer warriors, either. They made 16 hats for adults, both men and women, which is quite impressive as these hats tend to take more of a time commitment due to the larger size. These hats will bring hope to 218 families- these young ladies are making a major impact and truly living the Girl Scout Law, “Make the World a Better Place”. They are shining examples, and we thank each and every one in Girl Scout Troop 4134 and their families.